Scientists are losing optimism in the recovery of a French planet-hunting space telescope that suddenly stopped producing science data in November. The CoRoT mission's science instrument, comprised of a 10.6-inch telescope and a wide-field visible camera, stopped returning data Nov. 2. Engineers analyzing the problem blame the anomaly on a radiation-triggered disruption in communication between the instrument and the spacecraft's main computer. Attempts to restart the instrument have been unsuccessful, according to Annie Baglin, CoRoT principal investigator from the Paris Observatory. Baglin told Spaceflight Now the problem is likely in the instrument. The spacecraft is functioning normally as it orbits more than 550 miles above Earth. CoRoT stands for the Convection, Rotation and Planetary Transits mission. The project is led by CNES, the French space agency. CoRoT's instrument was designed with primary and redundant data chains. One of the data processing units failed in March 2009, leaving the payload completely reliant on a backup chain. Both data unit glitches occurred after CoRoT passed over the South Atlantic Anomaly, a region of heightened radiation caused by a dip in the inner Van Allen radiation belt, which funnels energetic protons into the path of satellites in low Earth orbit. 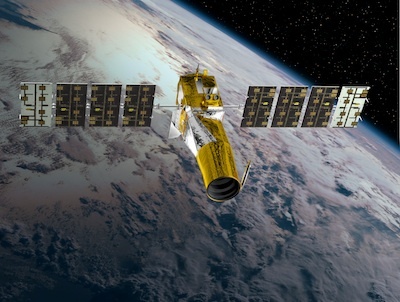 CNES tried reviving the instrument in December after rebooting the entire satellite on a backup data bus, but the workaround did not work, according to Malcolm Fridlund, CoRoT project scientist at the European Space Agency, a partner in the mission. Fridlund said there is evidence the instrument's data processing unit is working. Telemetry shows a temperature rise in the unit's electronics box each time engineers try a restart, but no science data comes down to Earth. Baglin and Fridlund said CNES engineers are studying other ways to recover the CoRoT instrument, but the scientists acknowledged the mission's outlook is bleak. "It is very unlikely that we will recover operations," Fridlund said. "CoRoT has been a great success, but it was a pity it failed because three days before the failure, the mission had just been extended a second time, and we have a very exciting program for this. But C'est la vie as they say in France." CoRoT, which marked the sixth anniversary of its launch last week, was the first space mission dedicated to searching for planets circling other stars. CoRoT's telescope looks for exoplanets by measuring tiny dips in the brightness of stars caused by a planet passing in front of it. The mission was designed to last two-and-a-half years, but CNES had extended operations until 2016 a few days before the Nov. 2 anomaly. Since starting its science mission in 2007, scientists have used CoRoT to discover 34 new exoplanets. Five more planet candidates are close to being confirmed, Fridlund said. Astronomers still need to do more analysis to confirm about 200 more planet candidates observed by CoRoT, according to CNES. CoRoT discovered the first rocky planet beyond the solar system in 2009. The planet, named CoRoT-7b, is located 480 light-years from Earth and orbits its parent star every 20 hours. The planet is nearly five times as massive and 70 percent larger than Earth, leading astronomers to believe its surface is solid. But CoRoT-7b is so close too close to its star to support life. 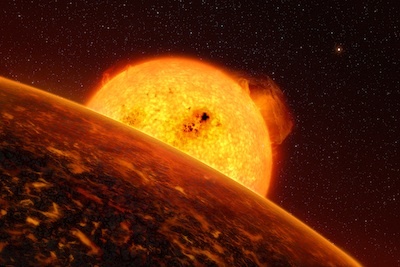 Temperatures on the day side of the planet may reach 3,600 degrees Fahrenheit, according to astronomers. NASA's Kepler observatory, which features a larger telescope and a more powerful camera, has so far found 105 confirmed planets and more than 2,000 potential new worlds still requiring follow-up study. Officials have not released the final 18 months of CoRoT's science data, so astronomers could find more planets credited to the French mission, Fridlund said.